The Neoflam Cookware set is quite a different from any other cookware. This set is made of high-quality aluminum and thick ceramic coating. It got the colorful exterior and white interior due to the ceramic coating. It also gets the most eye-catching design which will definitely grab any one’s attention. This set would be the center piece of your kitchen and cooking style. 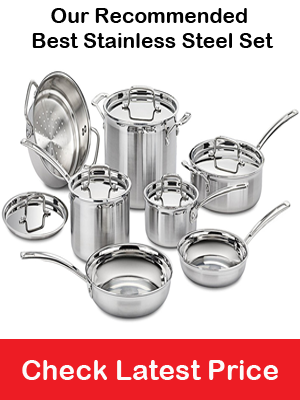 This cookware set includes seven pieces of cooking pots that would need for any home kitchen. If you are not planning to get a huge cookware set where every pots and pan has 2 or 3 different sizes, then this basic set will be perfect for you. It offers saucepans, frypans stock pots and more this ceramic pots are great for healthy meal preparation and serve as well. Its great color and shape made it equally attractive in your dining table. The Neoflam cookware is not like other ordinary cookware sets. This high-quality aluminum made cookware set with vigorous and colorful appearances makes it more different from others. It has a unique shape compared than regular nonstick cooking pots. Although it’s easy to use in various food preparation and quite handy to use for cleaning. Besides, it comes with different cute color which will really attract many customers especially the female. This set is made in Korea. You will get the best Korean quality with this model once you start to use it. To make these things more clear here, we are going to discuss some of the major features of the Neoflam cookware set. Have a look below. One Saucepan with Glass Lid 1.5QT or 7-inch. One Stockpot with Glass Lid 4.5 QT or 9.5-inch. One Low Stockpot with Glass Lid 2.5QT or 9.5-inch. These pots are made from 1/3 cast iron and aluminum. This metal has well for in quick heat absorbance and even heat distribution. Also, it’s lightweight and very durable. This cookware set from Neoflam is highly scratch resistant and durable. It also has the thick ceramic coating for super nonstick performance. This nonstick surface is great for healthy low-fat cooking and also easy to clean. Moreover, it comes with tempered glass lids along with the steam release vent and integrated Bakelite handles. These handles are heat resistant and allow ease of cleaning. These are suitable for your regular cooktops. Don’t use them in induction cooker. Aluminum pots are not suitable for induction cooking. This nonstick cookware set is great to add a new dimension to your diet plan as well. It’s thick ceramic coated surface is great for even heat distribution and cooks the food evenly. Also, it’s good for low oil or fat cooking. Its smooth surface releases the food ideally so while the food in on the pot it will cook every portion of it without burning. The Neoflam cookware will lessen your oil usage almost half percent. Even if you are not on the low-fat diet but still its beneficiary for long-term health. A low-fat diet will keep your weight in a fixed place or help you to reduce weight. Moreover, this cookware set is completely safe for everyday cooking. It’s free from any harmful chemical or material that can cause health hazard in future. The nonstick interior of these set is really amazing. It’s not only good for little oil cooking but also great in fast food release. That is the reason you don’t need much time and energy to clean the post correctly. Just simple dishwashing soap and regular water will do the best job the wash all the dish and pans. However, if anything burns and stick a bit on the surface then simply scrub them with your sponge by using warm water. It will clean eventually. This cooking pots are not dishwasher safe. If you clean them into the dishwasher, it may weaken the life of the materials especially the coating. Includes steam release vent on the glass lids. Lightweight and heat are conductive. The glass lids are bit weak. Now, it’s time to discuss some alternative options on this Neoflam Cookware Review. Hence, the Neoflam cookware is a high-quality cookware; we tried to pick something that could match with its workability. Like the Happycall Hard Anodized Ceramic Nonstick Pot 10-Piece Set. This heavy-duty cookware is suitable for use in oven and dishwasher as well. You can use the set for your everyday cooking make any food item. However, it has the different color of pots and a uniquely designed glass lid which is not only ergonomic but also smart to look. The next alternative cookware is formed Neoflam. The Retro 5 Piece Non-Stick Cookware Set is a real nonsticky cookware set for a small kitchen. It has one stock pot, fry pan, and a saucepan. This mint color soft touch cookware set is perfect for evenly cooking any food. its also give a comfortable feeling and look in your kitchen. Q- Are they suitable to use on an induction cooktop? A- No they are not suitable for using induction cooktop. A- It comes with limited lifetime warranty service. Q- Are they metal dishwasher safe? A- No, they are not suitable for use in the dishwasher. At the end of Neoflam cookware review, it appears that you will get a quality, thick and durable nonsticky cookware for your daily cooking. It’s not like other cheap and flimsy cookware set available on the market. They are only shiny and looks great in first appearances but never last so long. This seven-piece cookware set may bite pricey but still worth the price. So you can carefully use them, the Neoflam Cookware will surely last for many years.